There might be slight difference (no impact on the functions and usage) between the product and the images due to different batches. Post-sale service: 45 days refund money the guarantee and lifelong online support service. Generally speaking, a newly-bought tablet PC should be attached with a good screen film for protection. This 10-inch screen film can just meet your demands with high quality and protect your apad screen from any contaminates or scratches! Easy for operation as well; just do it! 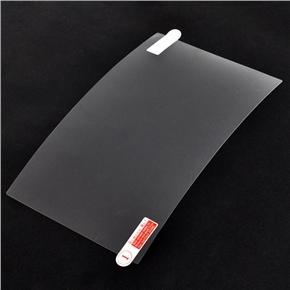 - Screen protector for your tablet PC with good quality. - 10-inch screen film (16:9). - Prevent your apad from daily wears. Economy Shipping 20-35 Business days Unable to track, Limited Policy, for details. Economy Shipping(Tracking) 15-25 Business days Tracking available,45-day Money-Back-Guarantee, for details. Standard Shipping 10-20 Business days Standard Shipping, for details. Express Shipping 5-10 Business days Tracking available,45-day Money-Back-Guarantee, for details. All products will be subject to strict quality test to make sure that the products sent to customers are qualified. Taking complex international transportation situation into consideration, we cannot assure you that all packages will arrive on time. We shall greatly appreciate it if you could understand us if the package has been delayed to a certain extent. Pleas view our transportation policy for details. We mainly accept PayPal payment. It's the most frequently and widely used online payment service. It provides protection for both buyers and sellers to the greatest extent. It supports credit card, debit card, E-check, and many other payment methods. It is convenient, fast, and safe. There's no requirement of registration, and no chances of exposing your account information. Meanwhile, you can also pay by Credit card, PayAnyWay (Includes all the main payment methods of Russia. ), Bank Transfer, Western Union. For details, please contact us. PayAnyWay For online Russian market: eWallets (Moneta.ru, WebMoney, Yandex.Money etc), self-service terminal networks (Elecsnet, MosCreditBank etc), bank cards (Visa, MasterCard), mobile payments, phone retail stores networks (Euroset, Svyaznoy), money transfer systems, bank transfers etc. 45-day Money-Back-Guarantee. 1 year after-sales service. Lifelong online technical support. Please feel free to contact us if you didn't receive the package or quality problem exists. There will be professional after service personnel helping you solve the problems. Customer Rating: 7 customers would recommend this product to their friends. Agree with them, or you have different ideas? Write your comments. Great protector for my tablet! Thanks, BuySKU team! Хорошая пленка за свои деньги. Ничего не скажешь - хорошая пленка для вашей 10-ки. Быстрая доставка - в Украину за 14 дней. extremely quick shipment. thank you. Great product at awesome price! Can’t see the verification code? Click here for a new security code. Generally speaking, a newly-bought tablet PC should be attached with a good screen film for protection. This 10-inch screen film can just meet your demands with high quality and protect your apad screen from any contaminates or scratches!